Picking up a healthy, pre- packaged salad from the supermarket can feel a virtuous thing to do... Until you find yourself throwing it out after a few days , the leaves wilted down to an unappetising mulch. Just why are the lives of packaged salads so habit, compared with, say, a whole lettuce? Actually, it's surprising that the leaves are still in one piece even immediately after packing, given that they have already undergone harvesting, transportation, sanitation, having excess water removed... Apparently, only the salad crops with the most 'robust' leaves can survive this. With such effort going in to bringing these salads from the soil to the shelf, wouldn't it be wonderful if they lasted just a little bit longer? Researchers at the University if Southampton in partnership with Vitacress ( one of the leading salad producers in Europe) are turning to genetics to find an answer. Salad leaves tend to last longer if they are small and thick, with lots of tightly packed cells. To understand which parts of the genome are responsible for these traits, the scientists generated a 'mapping population' between a wild and cultivated lettuce species. Breeding the offspring together causes the original parent DNA to break and recombine in random combinations in the progeny. 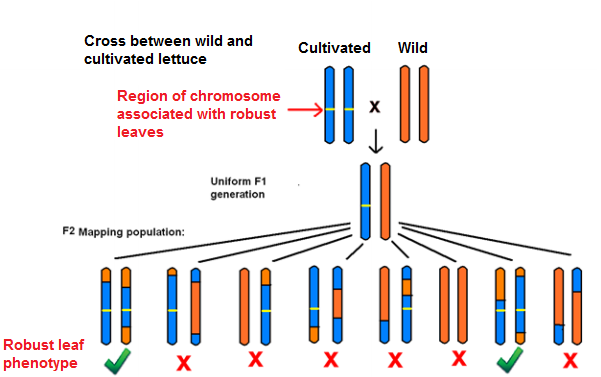 This means that, in the F2 generation, some of the offspring may inherit two copies of the genes for the desirable characteristics displayed in the cultivated parent ( see diagram below). Using genetic markers that can distinguish between the two original parents' DNA, the researchers can select plants showing ideal leaf qualities and determine which areas of the genome are responsible for the phenotype. It takes a lot of work to generate a mapping population, but the results can be highly informative. In this case, the genetic markers have allowed a new breeding programme to select for longer lasting leaves. Intriguingly, the scientists found an easier way to promote the development of small, tough leaves. Apparently, reducing irrigation by 20% encourages stiffer cells! whilst also saving water. Given that water use in agriculture is becoming an increasing concern, this can only be good news. So while we wait for the development of longer lasting supermarket salads, perhaps you should ask yourself if you really need to water your veg patch today? We're on the Today Programme...Tomorrow!